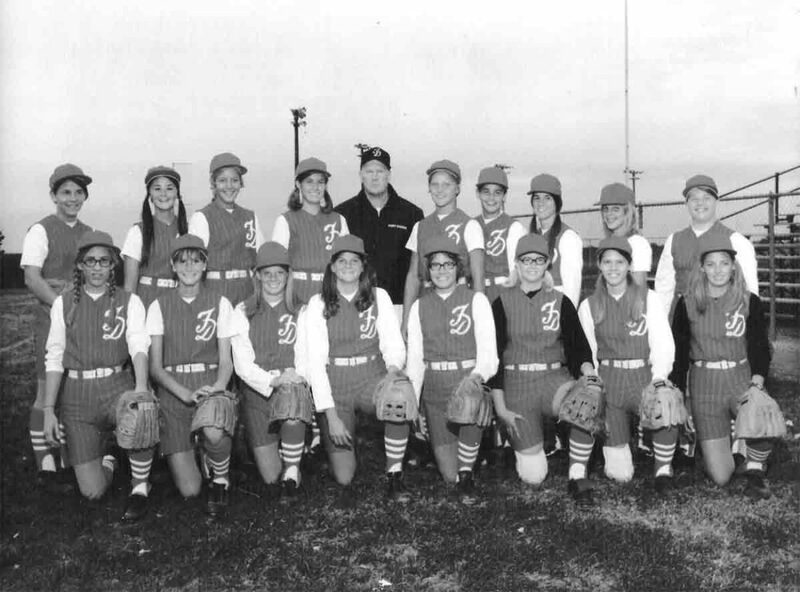 Here are the girls who are considered the first sanctioned Dodger high school softball team. They’re pictured, from left in the front row, Kathy Guetzlaff, Rochelle Netland, Dianne McCabe, Juanita Marsh, Pat Johnson, Annette Dillon, Pat Askelson and Darci Chalstrom. In the back, from left, are Rhonda Hauge, Roxanne Castagnoli, Karen Peterson, Pat Grace, Coach Ed McNeil, Laura Leege, Fran McCormick, Linda Salvatore, catcher; Kim Hearn and Carol Vasbinder. Back when I was in high school, girls state sanctioned competitive sports were not on my radar. Heck, it wasn’t on a lot of people’s radar. In 1971, when I graduated high school, few area schools fielded girls teams in any sports. So I suppose I come by my ignorance honestly. However, my cousin, Darci, who was Darci Chalstrom back then, helped change that. She was a member of the first Dodger softball team and the pitcher, at that. Her team qualified for state playing fall softball in 1971. It was Darci’s freshman year and she made an All State team. Before she was 14, Darci practiced with her dad’s women’s fast pitch team in Fort Dodge and then watched men pitch. “Dad introduced me to Dean Olson and other men fast-pitch pitchers to help me throw. However, I couldn’t throw the same as their hands were so much bigger,” she remembers. The family lived in Coalville. “At 14, some of us who played on the women’s team and some Rec players made up the first FD softball team. Though notable, her career in softball ended early. Girls State Softball has a rich history in Iowa, and particularly in Fort Dodge. The state tournament has been played on the diamonds of the Harlan and Hazel Rogers Sports Complex since 1970. This week, as outstanding high school teams from all across our state step onto Harlan and Hazel, it’s fitting to look back at the girls who helped begin what has become an extraordinary lineage of talent in sports.